Ground Chuck: Ground from the chuck (shoulder section) and contains 15-20% fat. Ground Round: Ground from the round (rump section) and contains 10-15% fat. Ground Sirloin: Ground from the front of the hip and contains 8-10% fat. In addition, the article provides six recipes all starting with a pound of ground beef (ground sirloin, to be precise). I don’t know about you, but I get excited about new ways to use ground beef. The beauty of ground beef, in my opinion, is that it is affordable, it is easy to freeze and keep on hand, and kids love it! I thought it would be fun to try out each of these new recipes and then share them with you. I will also give you my family’s review of the dish, rating the most important part of the recipe: Will kids eat it? 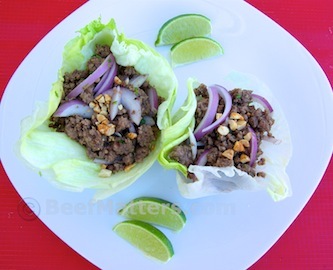 Our first recipe is Thai Beef Cabbage Cups. The first thing that appealed to me after reading through this recipe was the total time it took to get this dish on the table, 27 minutes. Score! I was pleased to discover that it was 27 minutes for your average cook (me), not just your average chef (definitely not me). This dish is very flavorful and won rave reviews from the crowd around my table. The kids enjoyed it and I caught my husband taking the leftovers for lunch the next day. Enjoy! 1. Heat large nonstick skillet over medium-high heat. Add 2 tsp. oil to pan; swirl to coat. Add ginger and garlic; cook 1 minute, stirring constantly. Add beef; cook 5 minutes or until nicely browned, stirring to crumble. 2. Combine remaining 1/2 tsp. oil, sugar, and next 4 ingredients (through pepper) in a large bowl. Add beef mixture, onion, and cilantro; toss well. Place 2 cabbage leaves on each of 4 plates; divide beef mixture evenly among leaves. Top each serving with 1 1/2 tsp. peanuts. What would I change about this recipe? I did think this dish was a little salty and that comes from the fish sauce. Personally, I didn’t find it too salty, but if you have a low tolerance to salt I would suggest reducing the fish sauce to 1T. You must be a kindred spirit. I made these last night and was looking around for others who might have tried this recipe. What was funny was my fish sauce. I borrowed a bottle from a neighbor, 8 years ago, she told me to keep it because there was only about two inches left at the bottom of the bottle. I’ve probably used it one other time since then. I smelled it and of course it’s fermented, that is how it is made, and it was really strong. So I threw caution to the wind and use the fish sauce. We survived with no ill effects, but I was thirsty the rest of the evening drinking several glasses of water. If I make these again, I would leave out the fish sauce. Thanks for your review, and I love the recipes in Cooking Light too. Love your story! I’ve been looking for low-sodium fish sauce, but so far I haven’t come across any. Thanks for stopping by!